Wrinkle Relax (formerly Faux-Tox) - A non-toxic, anti-aging peptide chemically combined from naturally derived amino acids. Works in a non-paralytic way through a reduction over time of neurotransmitters that mediate or initiate muscle contractions. 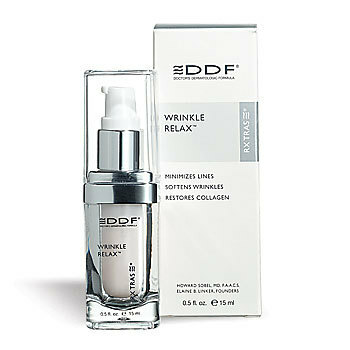 Helps prevent fine lines induced by repeated facial movements without loss of natural expression. Reduces intensity of muscle contraction. Reduces the appearance of wrinkles. Minimizes and softens lines. Relaxes muscles. Depth and size reduction. Reduces catecholamine release. Catecholamines are necessary for muscle contraction. Apply a thin coat to clean, dry skin, twice daily. Results can be seen starting in two weels with maximum visible reduction of fine lines and wtinkles up to 50 percent withing 45-60 days. Most effective in orbital eye area and forehead. After 60 days once a day application maintains results. May be used as other facial treatments diminish.